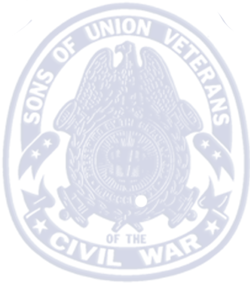 Starting back in 2009 the Brothers had discussed creating an award to encourage service to the SUVCW and the Camp. As in most organizations it is sometimes hard to get the manpower to get things done. Many felt we needed a system to encourage and reward service by the Brothers of the Camp. At the October meeting on 10-1-2011 the medal for the Order of the Legion of Merit was presented to the Camp. As one can see from the photograph (medal at full size) it is a very beautiful award. 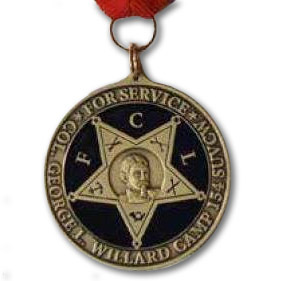 With its bright red neck ribbon, 1.75 inch medallion and portrait of Col. George L. Willard it is an outstanding symbol of a Brother’s commitment to service. As it appears in the photograph the medal depicts the first level of membership in the Legion, that is, the rank of “Legionnaire Third Class” and requires the accumulation of 3000 points for service to, or for, the Camp. The original concept was around for some time before the first document was introduced to the Brothers on 11-6-2010 by the previous Camp Commander Robert C. Hensel. Since then numerous discussion have taken place about the award and the make-up of the system for accumulating points. In January 2011 a score card was given out to all members present at the monthly meeting. At the time it was decided that 100 points would be given for attendance at our regular meetings or short events and 200 points for approved activities of two hours or more. The Brothers use an honor system in assigning points and have another Camp member “sign off” on their card. At each level, and there are ten, the Brother will receive uniquely designed certificate. 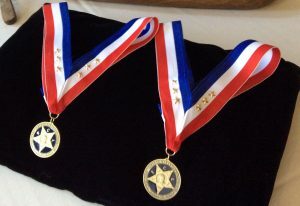 It will be the Brother’s choice to purchase the medal which will sell for $24.50. As the Brother goes up in levels, stars will be added and the ribbon color will change but the medal will remain the same. The medal was struck by Northwest Territorial Mint in Dayton, NV (www.nwtmint.com) with Darrell Johnson at the mint assisting the medal’s designer, Brother Robert P. Keough. Brother Keough solicited input and suggestions from Brothers Dziewulski and LeMay prior to final design submission to Northwest. At the October meeting Commander Dziewulski strongly encouraged Brothers to get involved with Camp activities and begin earning their way up the levels of the Legion of Merit.